The Kamehameha Schools Maui girls paddling team emerged as the Maui Interscholastic League champion after Saturday’s final league regatta at Kahului Harbor. The Warriors finished third Saturday with a time of 4 minutes, 21.28 seconds, but their win on Jan. 6 and second-place finishes on Dec. 16 and Jan. 20 gave them the best three-regatta total. 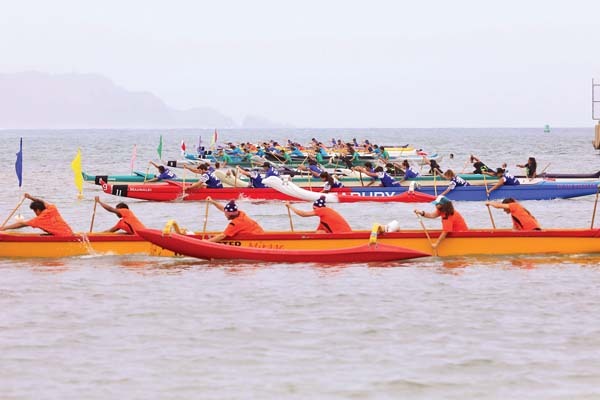 King Kekaulike, which won the season’s fourth regatta after bringing up a couple of paddlers from the junior varsity team, followed up with another win Saturday in 4:16.44 and clinched a spot for the state regatta, which will be held next weekend at Hilo Bay. Molokai, which won the season-opening regatta, clinched the other girls state spot. The Seabury Hall boys crew completed a sweep of the season’s regattas, winning in 3:48.81. The Spartans, who had already clinched a fourth straight MIL title, the Warriors and Na Alii earned spots for states. In the mix division, Seabury Hall (3:59.00) beat out league champion Kamehameha (4:07.07). The two crews, as well as King Kekaulike, will represent the MIL in Hilo. Girls–1. King Kekaulike (Jennea Nagura, Sarah Emmsley, Skyler Sands, Samantha Emmsley, Wailupe Subega, Kamakana Kawaa) 4:16.44, 2. Seabury Hall 4:18.80, 3. Kamehameha Maui 4:21.28, 4. Molokai 4:27.70, 5. Maui High 4:34.21, 6. Lahainaluna 4:37.36, 7. Baldwin 4:53.07, 8. Kihei Charter 4:53.46, 9. Lanai 5:21.59. Boys–1. Seabury Hall (Robert Gibbons, Haena Balinbin, Kai Ponting, Kainalu Kubo, Rieley O’Conner, Dylan Newbro) 3:48.81, 2. Kamehameha Maui 3:52.53, 3. King Kekaulike 4:05.12, 4. Baldwin 4:08.09, 5. Lahainaluna 4:14.95, 6. Kihei Charter 4:20.23, 7. Maui High 4:23.02, 8. Lanai 4:34.17. Mix–1. Seabury Hall (Taysia Pimentel, Kai Ponting, Kaya Givensel, Kainalu Kubo, Shea Stisher, Dylan Newbro) 3:59.00, 2. Kamehameha Maui 4:07.07, 3. Maui High 4:27.55, 4. Kihei Charter 4:33.73, 5. Baldwin 4:38.41, 6. Lahainaluna 4:39.63, 7. King Kekaulike 4:46.21, 8. Lanai 5:05.88, 9. Maui Prep 5:15.48. Girls–1. Kamehameha Maui, 2. King Kekaulike, 3. Molokai. Boys–1. Seabury Hall, 2. Kamehameha Maui, 3. King Kekaulike. Mix–1. Kamehameha Maui, 2. Seabury Hall, 3. King Kekaulike. Girls–1. King Kekaulike 2:01.11, 2. Lahainaluna 2:09.95, 3. Kihei Charter 2:12.39, 4. Baldwin 2:13.36, 5. Seabury Hall 2:14.74, 6. Kamehameha Maui 2:15.22, 6. Maui Prep 2:20.04. Boys–1. Seabury Hall 1:55.36, 2. Kamehameha Maui 1:56.45, 3. Kihei Charter 1:58.84, 4. King Kekaulike 2:00.84. Mix–1. Baldwin 1:59.02, 2. King Kekaulike 2:02.30, 3. Lahainaluna 2:02.66, 4. Seabury Hall 2:03.32, 5. Kamehameha Maui 2:04.44, 6. Kihei Charter 2:08.89. Season champions–Girls: King Kekaulike; Boys: Seabury Hall; Mix: Seabury Hall.